When this book was first published in 2007, I was convinced that women were finally ready to focus on being powerful with their money. Indeed, many women heard the call. The book connected with a few million readers. It reached the top of the New York Times bestseller list, and tens of thousands of women took their lessons of the book to heart and forged healthy and strong relationships with their money. But, in the years since, I’ve come to realize that many more women–even some who bought the book–continued to ignore their issues with money. Or they struggled to make confident decisions that would help them achieve lasting security. I was very confused by this. What was preventing women from being as powerful with money as they were in other areas of their life? When I had money and a low Respect Level, I did not manage my money well. When I had little, but a higher Respect Level, I developed the ability to manage the money I had. When I developed an even higher Respect Level, my heart and mind opened to God, Jesus, and the Holy Spirit and I delightfully discovered what I have or do not have does not matter … because now I have the faith and trust they have my back … whatever choices I make. Goodbye worry and hello peace because experience has also taught me I have what I need when I need it and even when I don’t like circumstances, I know this too shall pass. Lord almighty I wish I had got this sooner, but better later than never, though of course since God revealed my life’s purpose, Connecting The Dots With The Respect Principle concept, company, and global initiative, he knew what needed to change in me. Of course and thankfully, he knew how and when to get my attention. And since I’ve discovered he is also my banker, I don’t even have to try to figure out how, I just need to keep doing my parts. And get this! I have also discovered that giving a percentage away to help others, in the spirit of true giving, not giving to get back or a receipt, before I help myself opens the door for God to give me more since he has taught me well. What a joy to discover helping people, which has always been a strong drive in me, isn’t just about expending my energy, but giving them money too! Saddens me to think how I could have helped so many people when I had much, but lifts my spirits to know when abundance comes again, I will know what to do. Thank you for dropping by with your curious open mind. Wishing you abundance of all kinds … and the Respect Level to use your abundance wisely from the heart and mind. Breaking old habits and patterns is easier when we turn our attention to those who, one, never had the problem or, two, were successful in making the positive changes we also want … including the results. Evidenced by the results of pulling in a large amount of money in my thirties with my husband and the debt we were both left with after our divorce, revealed big changes needed to happen. And for me they have, but in small, gradual steps. For my ex-husband things were different. There was no problem for him getting out of debt once my poor money mindset and my new non-traditional goals were out of his life. Mind you, working for Ontario Hydro and the bequeath from his parents’ estate made his transition into liquidity much faster and painless. After a few years on my own, plus breaking into a new field, writing, I turned to credit because I did not believe any other way was possible. Of course, after leaving the corporate world I was later stunned by my return to the retail sector to discover how retail jobs were still minimum wage, yet were no longer full-time, and no longer offered any benefits, as much of the work was “contract” versus employee. When the work ran out and I was let go, I was still recovering from the shock of several personal events so my thinking was not clear and I did not apply for unemployment insurance. I certainly did not know anything about social services either. My journey to a debt-free life began a few years later, but only after I had to suffer the embarrassment and consequences when I filed for bankruptcy because I could not envision how I was going to be able to pay back the creditors and live, without going crazy from the hounding calls from creditors in the meantime. For the next fourteen years, cash, bursaries, and barter were king of my finances. I also discovered many people believe poor people steal, yet I also discovered how wrong that assumption is because one, I did not steal, though shopping became a hide and see game in grocery stores as I looked for the best deals for my budget and two, though some impoverished people do steal, in my personal experience, I observed more theft by middle and upper class, sometimes directly and sometimes not, but that is another story, as is the story about how the impoverished are taken advantage of by those not impoverished. Thinking debt would not be in my future again, I was not prepared for the scenario of having to move back to the community I left in my thirties to help my dad in his last years. The first year and a half was promising because I secured a job and home, all within a few blocks of my dad. The part-time job paid fourteen dollars an hour, but the cost of living in an Ontario Hydro community, plus the money needed to help dad out before he was forced out of his home by health needs was not met by my income. Once again I had to turn to credit. Not knowing what was going to happen when dad had to be moved to long-term care, I thought going into debt would be resolved quickly, but suddenly I could no longer work having to be on call 24 hours. A move into my brother’s basement housed me and the hounding creditor phone calls began. By 2015, Dad finally passed away. A year later, I was finally well enough again to move away. And a year after that I turned to money management experts to help me move forward financially. 60% for taxes, home costs, living costs, vehicles, etc. I liked the simple guideline, though as a Christian, there was one modification I had to make … reducing 60% to 50% in order to have 10% to give away. Because my experience with creditors showed they believed they should have all the money I receive, I understood why they handed off their outstanding debts to some of the worst bullies and abusers I have encountered … and I have encountered quite a few in my lifetime … in order to keep their hands clean. For this reason, I also appreciated what I have learned about money management … that in order for me to pay back all of my debts (the first bankruptcy also), I need, like all people, to be able to pay for a home to live and rest in, as well as, to stay healthy and thrive in order to be a contributing versus a draining member of society. My experiences with lenders, especially a surprising few high-profile ones, have turned me off ever going into debt again, which, as time will show, will be to their loss because one day I know I will be restored and they will never see me walk through their doors to buy any of their other services. I also think it’s time for lenders to wake up and develop higher “Respect Levels” business practices in order to balance out their capitalistic endeavors with compassion because, whether they know it or not, when some lose, we all lose. Whatever your current money management style, I hope you too develop a high enough “Respect Level” to keep what you need and to give to those in need … because we never know if we, or a loved one, will one day be the one in need m… because, believe it or not, we win when everyone else wins too. If our beliefs don’t provide us with a joyful, satisfying life, that is often the indicator it is time to reconsider our beliefs. 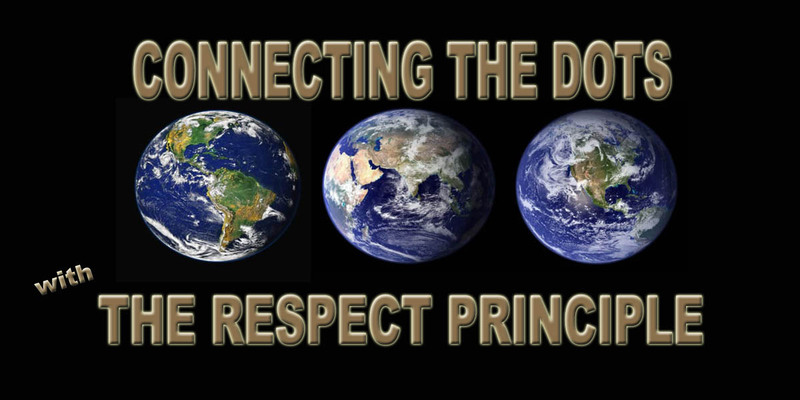 A growing “Respect Level” for myself, as well as, others, prompted me to re-examine what I believe, my thoughts, and my actions. Discarding limiting, negative, and even other people’s beliefs made room for me to choose how I want to live, and, as a result, raised my quality of life to the point that fear, worry, and negativity no longer control my life … I do. Wishing the same for you … one of the best gifts you will ever receive.